The pea stem vascular bundle shown here, has undergone limited secondary growth. The primary phloem is capped by primary phloem fibres (PF) which are still relatively thin-walled. Beneath the fibres, you can see a broad band of phloem tissue, with some of the smaller protophloem elements visible, between the larger parenchymatous elements near to the fibres.. metaphloem sieve tubes (ST) contain conspicuous protein aggregates and occupy 5-6 rows of cells, immediately exarch to the cambial zone (CZ). The cambial zone has produced a few, as yet, unlignified secondary xylem elements but little evidence of secondary phloem differentiation can be seen in this photomicrograph. The primary xylem consists of broader diameter metaxylem vessels and narrower tracheary elements including lignified parenchymatous elements. Internal to this are several rows of narrow protoxylem vessels (PX). 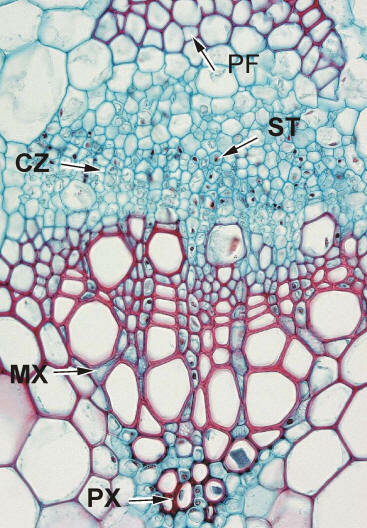 The pea plant, like many other herbaceous plants, wastes little energy in the production of lignified secondary xylem, and mechanical support for this stem is provided by the primary phloem fibres as well as the functional xylem elements.